For those of us in North America--and any other locale where folks celebrate the holiday--it's that time of year again. And when I say "that time of year," I of course mean Halloween. While my compatriots spend the next couple of weeks prepping costumes, planning parties and popping orange and black candies into their mouths, I'm going to spend them playing spooky games. Specifically, I'm going to play--or maybe I should say I'm going to do my best to play--the following trio of Halloween-appropriate titles. Undertale (Mac)--The good news here is that I've already started playing this just-released, EarthBound-esque RPG. The bad news: I've only played about an hour and a half of it so far. I have no doubt that will change appreciably by the end of this coming weekend thanks to all of the grins and chuckles it's already produced. My favorite aspects of Undertale at the moment, by the way, are its colorfully creepy "overworld" graphics, its wonderfully witty text and its unexpectedly unique gameplay. 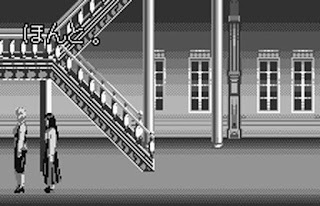 A highlight of that last component: if you want, you can dance, flirt or simply chat with baddies rather than beat them up during this title's battle scenes. 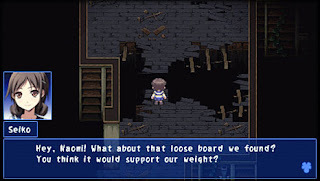 Corpse Party (PSP)--I put a small handful of hours into this game a couple of years ago while traveling for one reason or another. That playthrough came to a screeching halt, though, when I got stuck and couldn't figure out what to do next. Why didn't I turn to GameFAQs or some other online resource? I have no idea, I'm sorry to say. Thankfully, I'm feeling decidedly less stubborn these days--especially after listening to my podcast pal, Mollie, rave about this original entry in the oddly titled Corpse Party series while we recorded the 17th installment of The Nichiest Podcast Ever a few nights ago. So, look for me to give the game a second chance (and write about it in one or more future blog posts) between now and the end of this month. 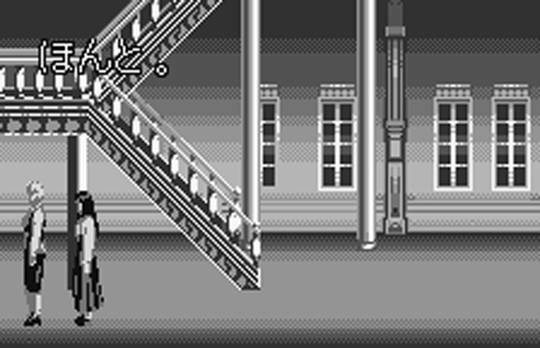 Clock Tower (Super Famicom or WonderSwan)--Can you believe I've never played any of the many versions of Clock Tower that have been released over the years? I can't. OK, so that's not completely true. I spent about 30 minutes with the Super Famicom release earlier this year, but I quickly gave up on that campaign when the game's scissor-wielding antagonist popped up and scared the living daylights out of me. I can't guarantee the same thing won't happen again when and if I return to this pixelated horror title, but I can guarantee I'll do my best avoid it. Who knows, maybe playing it in black and white will help? Any you playing any spooky, scary or otherwise Halloween-esque games this month? If so, which ones--and what do you think of them thus far?